Well, here's something cosmic to be thankful for this weekend. 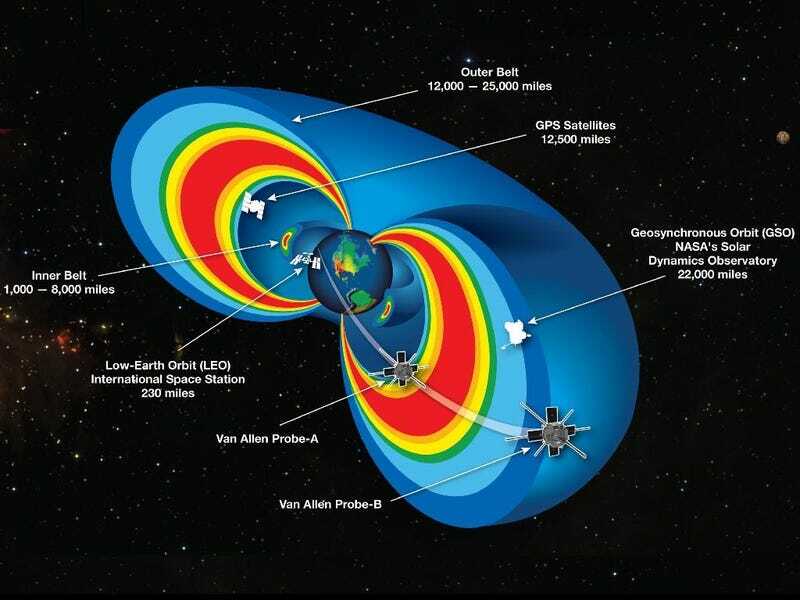 A NASA-led study of the Van Allen radiation belts has uncovered new information about the invisible "shield" that keeps harmful ultrarelativistic electrons from the Earth. In a study published in Nature, scientists from MIT and the University of Colorado at Boulder detail their analysis of data from NASA's Van Allen Probes, which are studying the radiation belts around Earth—just last year, the probes reported the existence of a new, previously-unknown third belt thousands of miles above the Earth. In short, these craft are sending back vital information about the space around our planet. And in Nature this week, we found out even more. Based on their data and calculations, the researchers believe that plasmaspheric hiss essentially deflects incoming electrons, causing them to collide with neutral gas atoms in the Earth's upper atmosphere, and ultimately disappear. This natural, impenetrable barrier appears to be extremely rigid, keeping high-energy electrons from coming no closer than about 2.8 Earth radii — or 11,000 kilometers from the Earth's surface. In the MIT report, John Foster, associate director of MIT's Haystack Observatory, described the discovery of this shield as "a very unusual, extraordinary, and pronounced phenomenon," since it's rare to find such a sharp stop in the atmosphere. He added that the discovery tells us more about what spacecraft and humans can endure many miles above the Earth.